New BSD license. Please see license.txt for more details. Will be adding high availability, replication and autosharding using the same zeromq framework. Instructions for an EC2 Ubuntu box. Thanks to all the folks who have contributed to all the dependencies. Special thanks to pyzmq/examples/mongo* author for inspiration. Use Dromaeo for the purposes of comparison. It is super easy to run and compare. During every run, machine had only 3 apps open. One putty session, one process explorer and the relevant browser. So machine resources are same for all. Run all the benchmarks on Windows box - Dell Poweredge SC 420 - XP, Pentium 4 HT, 2 CPU 2.8GHz, 2GB RAM. Used Macbook Pro 15" to make sure the trend is same. 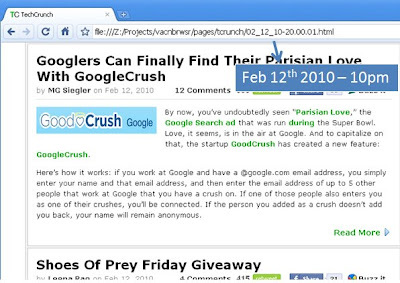 Opera has save-as text file feature. So after all the runs, results are extracted by loading the html page in Opera » save as text file » then run following one-liner to get every run into ":" separated text file so that it is easy to load up in excel. more * is being used above assuming all the text files are saved in the present working directory. Includes well balanced benchmark suite. 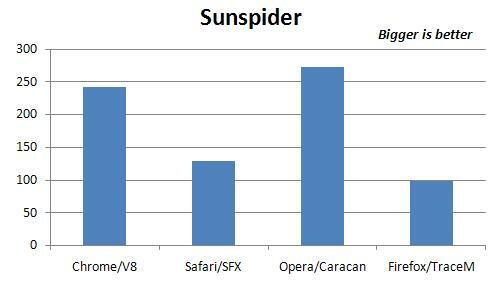 Covers various areas including math problems, string operations, crypto, raytracers, etc..
As seen above, Caracan is the clear winner followed by V8, SFX and TraceM for Sunspider benchmark suite. 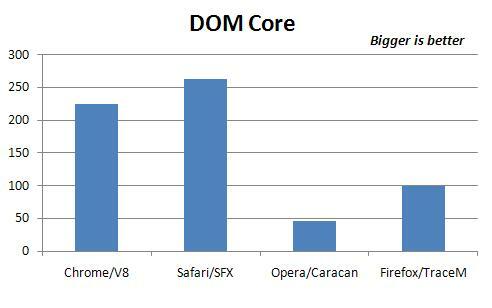 These tests include setting, getting DOM attributes, DOM traversal, DOM element querying, etc..
SFX is the clear winner followed by V8, TraceMonkey and Caracan for DOM Core suite. These include tests like looping, function calls, object manipulation, etc..
As seen above, V8 is clear winner followed by Caracan, SFX, and Tracemonkey for V8 benchmark suite. 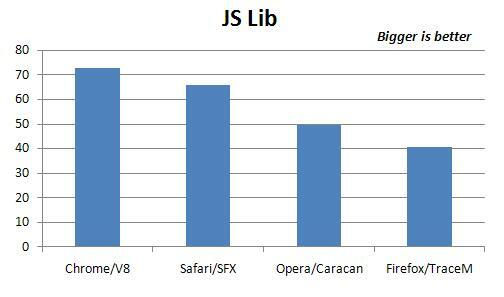 As seen above, V8 is clear winner followed by SFX, Caracan, and Tracemonkey for JS Lib benchmark suite. I haven't included benchmarks Dromaeo and CSS Selector. Dromaeo; because Caracan results were like 100x on regexp cases which I wanted double check if it is indeed the case. CSS Selector; because each run takes like ~20mins which is quite a bit considering multiple runs. 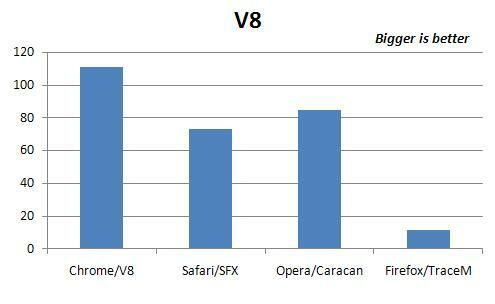 If you follow technical documentation on V8, SFX, Caracan and Tracemonkey, you can clearly see similarities in approach each is taking in tackling the problem. Some of the common techniques and modes are creating virtual machines, JIT techniques, inline cache, GC optimizations. Yet there are few differences in each engine. V8 doesn't generate bytecode instead it generates native code directly - similar to compilation for static languages. However it does follow virtual machine techniques under the hood without having two separate steps. SFX generates bytecode and then native code based on the platform it is being run. This approach is similar to LuaJIT where JIT techniques are applied on the bytecode. Caracan seems to take best of both - native code compilation for loops and bytecode interpreter to tackle remaining part of the code. Tracemonkey is slightly different compared to other in that it is the only engine which tries to record/trace as the interpreter kicks in - more details on this here. Jigermonkey is the next version(still in works) to TM which seem to take SFX assembler and combine it to the existing spidermonkey and tracer. 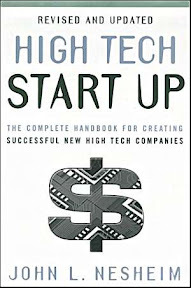 Here is a write-up on couple of books that I liked reading and learning internals about start ups and how it all works. I would recommend both of them equally. Both have their own strong points in various topics. For example, 'High Tech Start Up' shines in the area of market analysis and product planning; 'Engineering Your Start-up' shines in the area of accounting and finance with lots of templates and ready-made excel sheets to get started with planning. Again, just like any good book and education, learn as much as possible and see what makes sense and relevant for your situation. It has 14 chapters in total - spanning over 270 pages. The most impressive thing I liked in this book is market and product planning. According to the author, if we assume x-axis being a product and y-axis being a market - following quadrants can be made. Quadrant 1: New Product and New Market - Missionary sales and tech push. This is where, consumers don't know they need the product and there is no existing product. Typically high risk and costly. 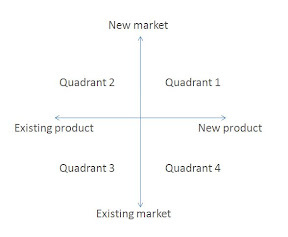 Quadrant 2: Existing Product and New Market - Marketing driven and essentially you are selling new use of the existing product. Quadrant 3: Existing Product and Existing Market - Face lot of competition. Can be used for income substitution. Quadrant 4: New Product and Existing Market - Tech push, market pull. Delivering value to existing problem. 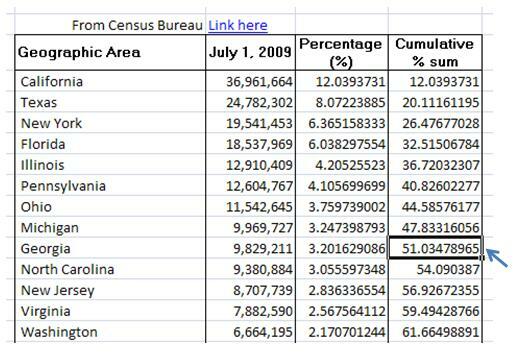 It is good if you are in Q4 - where you already have the market and with your product you are innovating. If you are in Q1, you would need lots of money raising to do. I found chapter 5, which deals with the business planning interesting in that, you would come to realize so many details that make up for a good planning. It has total of 21 chapters spanning over 400 pages. 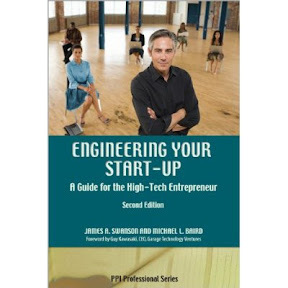 Accounting, Finances, and Term Sheets are dealt really well in this book. 'Rule of X Competitors' and Financial Statements really impressed me from this book. 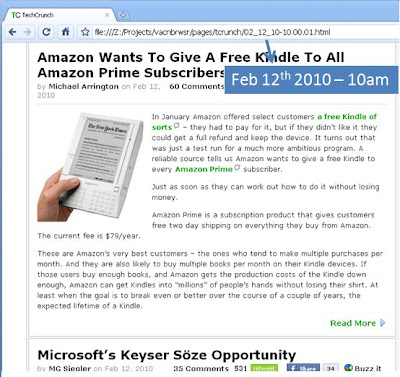 Rule of X Competitors: Take any market, at any point in time, there is a room for only X viable competitors. As from the definition, obviously, the smaller the X, the better. According to the author, if X is more than 7, you might want to reconsider the plan. On the Financial Statements, it is tough to cover details in a post like this, however following quick 3 statements are something you want to keep track of all the time. Final Note: Rules are there to break and laws are there to follow. So you can read and learn about how it is done typically but just adapt the rules according to your situation. When you are on vacation or don't have time to read all your favorite news sources on a given day, you might miss current news and trends which are happening and updated every day. There are days in which I just don't want to get online for reading news and browsing. 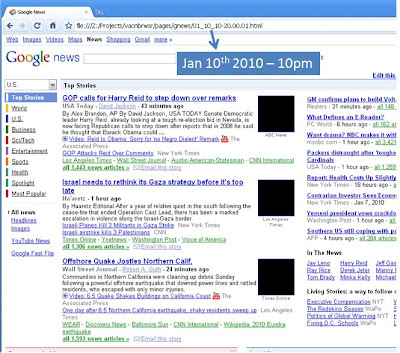 At the same time I don't want to miss the trends and highlights which are relevant on a given day. With few lines of perl code, wget, cronjob, problem is solved. Hope this helps others too. Some of this is very straight fwd. However, I am including detailed description so that everyone gets it without questions. Change paths in "vbr.cmd", "vbr.cron" - you can use your favorite text editor for this Change /home/srini/Projects/vbr/ - to your pwd from step 4. 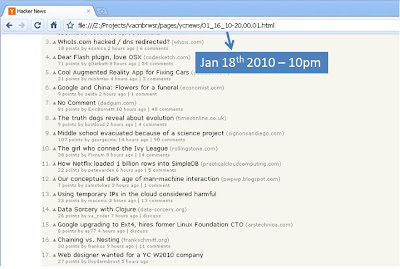 Add or modify sites that you want to archive in "list" First column is the web location. Second column is the directory name that you want to save the archive files to. 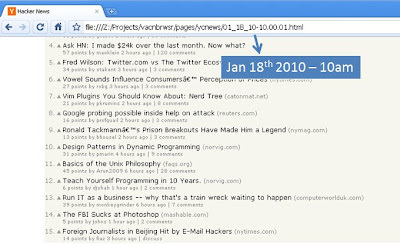 crontab -l If this returns nothing, jump to step 9 If you have other events already scheduled, do crontab -e and append the contents of "vbr.cron" to the list and you are done.